New 2019 Minnie & Wheel Bearings Needed Grease? We bought a new 2019 Minnie 2250DS last June and put about 1500 miles on it last year. Even though it hasn't yet been 12 months/12,000 miles as the Lippert owner's manual states (Lippert manufactures the axle/wheel assembly), I decided to pull the wheels and lube the bearings, just to be safe. The good news is I was surprised to find an easily accessible zerc grease fitting under an easily removed rubber dust cap once I had the wheel off. The manual says for this sort of assembly, to apply the grease while turning the wheel until grease starts to appear from behind the nut. To get to the point, the four wheels took about 3/4 or more of a large tube of grease! I stopped putting grease in as soon as it showed up around the nut. I'm reasonably confident the bearings did have some grease as shipped from the factory, but the wheels sure took a lot more than I would have expected. 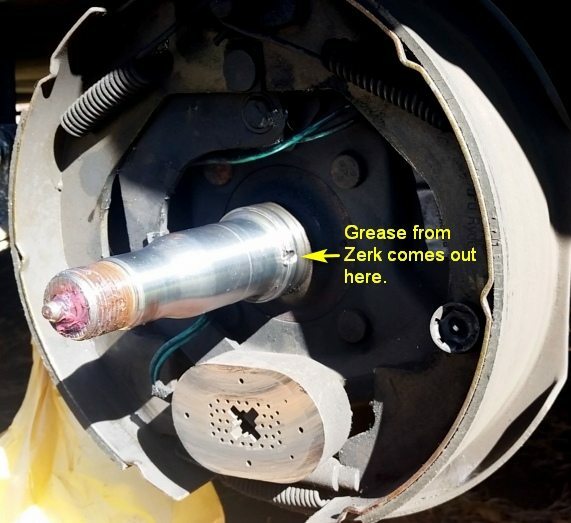 I believe the proper protocol to use the zirc fittings is to rotate the tire while pumping the grease. If one of the seals blew out you may have greased up the brakes. There's a lot of discussion on these Lippert hubs on the Keystone site. I haven't done a search on this site for discussions related to this, but I know there are boatloads on the other I mentioned. I recently at 5,700 miles (2250DS) serviced mine for the first time and inspected the bearings. All 8 Chinese bearings and races looked fine. I was amazed at how little grease was in the bearings. Evidently it was enough. Repacked, replaced, and installed new grease seals. Will go at least 10,000 miles before doing it again. I would never use the Zerk/pump method to grease my wheel bearings. I have read too many horror stories of grease being forced past the grease seals and wreaking havoc with the brake shoes. You would think this would cause poor braking but on the contrary, it causes the brake drums to start grabbing and flat spotting the tires. The reason that it takes so much grease to do this method is because there is a large cavity between the spindle and the hub that must be filled before the grease comes out the front bearing. I hope you don't have any of these problems.